Sorry for the delay on today’s page. My laptop has started acting up recently which is very concerning since I’ve been using this laptop for Team Stryker since spring of 2012. I used to use a desktop and laptop but gave up on the desktop when it started being more trouble than it’s worth. Hopefully I can get this baby humming again shortly. I hope you find today’s page worth the wait! 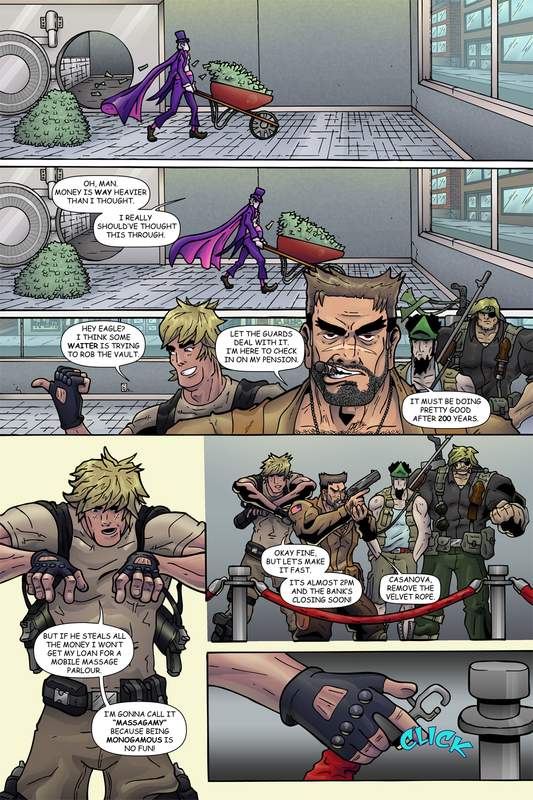 The beautiful thing about Team Stryker is that I don’t have to focus on how Team Stryker is going to meet when their villain and just focus on the jokes and action. Having Team Stryker start in the same bank as the Sad Magician saves SO much time that I can jump straight into the fun! Have a great week and I’ll have the newest page of Team Stryker waiting for you on Monday!